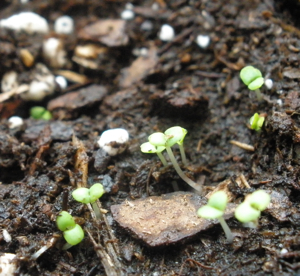 This morning I noticed my herb garden is beginning to germinate. I was so delighted by the discovery. Transplanting plants provides immediate gratification, but planting seeds is much more rewarding. My little concrete garden is growing well and developing. Each day I pray I don’t kill my potted plants and houseplants, hoping I won’t drown them or let them dry out. Each morning I wake up pleasantly surprised that my flowers continue to bloom and my plants are taking root. As I care for the seedlings, I have much more time to reflect on the process of growth and development. Its hard to imagine my husband at 6’5″ starting out as a single fertilized cell. But each one of us came from such humble origins and those seeds are reminders. It’s really a miracle how I got here, that I’m still standing here. I am grateful for the little signs of Allah’s creations. As I plan the curriculum for summer camp, we’re thinking about a science class featuring gardening, nature walks, and visits to the museums. Children often enjoy watching their classroom gardens grow. Children as seeds is an obvious metaphor. Everything we do in life requires cultivation and care. Finding our strength requires patience and diligence. I have my seeds and transplants for the fall. I look forward to the fall harvest and what I’ll learn about life between now and then. « Can We Rally for the Girl who Got Punched in the Face? I’m presuming you were aware today (19th June) is Juneteenth – I’m not reminding you to nag but because there is a controversy going on which seems to have been manufactured by one individual. A group of Feminists with Disabilities decided to have a blog carnival type thing today about Helen Keller, trying to show more than the typical “water over the hand” stuff that kids are taught about her. A woman called Renee who runs a blog called Womanist Musings kicked up a fuss because they chose this of all days to do it. FWD announced this more than a week ago and their blog is on Renee’s blogwatch (that thing Blogger has, where it shows a list of blogs and the most recent post on each), so I wonder why Renee left it this late to kick up a fuss. She posted about it here and links to some of the blog entries where she left a nastygram comment. She is basically accusing them of erasing a Black celebration by celebrating something else the same day. I am just wondering, do you find it at all offensive that people would choose this date to celebrate anything unrelated to Juneteenth? It seems really petty and nasty-minded, especially as some of those she is carping at have autism or one debilitating illness or another. I wasn’t really aware that today was Juneteenth, since I don’t usually celebrate it, kind of like Kwaanza. Today Philadelphia Muslims celebrated the Islamic Heritage Festival . There were plenty of Black folks out there, so I didn’t see anyone getting riled up that Juneteenth was not mentioned. However, I’m not going to dismiss Womanist Musing’s feelings. I do think she makes some good points about what identity should come in the forefront, disabled or Black. However, I’m just surprised she’s upset about something that is not so new. Most white people aren’t thinking about Juneteenth, disability or not. Most Black people don’t seem really care about Juneteenth either, except that there is usually an outdoor festival with a chance to dress up or underdress, flirt, eat some soul food or caribbean dishes, and listen to live music. I’ve hardly ever seen white people at Juneteenth festivals. There are plenty of holidays and events that go on during Black history month. In fact, most white people aren’t thinking about Martin Luther King Day or events such as the Freedom Train either. Just my thoughts. Assalamu alaikum, I don’t want to dismiss her feelings either, however, I’ve read her comments on the blog in question and she was rather rude, even when the blog authors tried to apologize and rectify the situation. And as I said on Yusuf’s blog, if you check the June 19 entry on Wikipedia, there are other things, like Catholic Feast days, etc., going on too. So yes, I understand but the rudeness, not only to the amin blog but to other blogs who participated in the blogswarm I think is just too much. I hadn’t read Renee’s comments on other blogs, just her posting. I believe in picking your battles. And sometimes people have enough time on their hands to battle everything. I do think her anger was a overblown and language counter productive. I read her comments on Indigo Jo’s blog and I was really surprised by the venom. The quick accusation of racist is also counter productive, it just dilutes the meaning of the term when we really need it to battle an injustice.